Fighting Golf is an arcade golf game developed by SNK and released in 1988. In the same year, it was converted for play on the Famicom and NES. The title screen of the arcade game features the signature and endorsement of famed golf player, Lee Trevino. 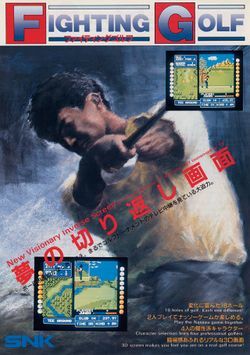 While the arcade game was only ever released under the title Fighting Golf, the home conversion for the NES was released in North America as Lee Trevino's Fighting Golf. The player can choose between four different golfers, of which each Character has his or her own advantages and disadvantages. Lee Trevino is playable as a character named Super Mex. Other characters include Pretty Amy, Miracle Chosuke and Big Jumbo. Pretty Amy has limited range, but easier to control ("control" refers to the length of the aiming guide). Miracle Chosuke and Super Mex have average attributes. Big Jumbo has the best range, but the worst control. Despite the title, no fighting is involved in the game. Gameplay is relatively simplistic, but was on par with video games of the period. The player has to avoid sand traps, water hazards, rough ground and trees. The courses range from relatively straightforward fairways to elaborate arrangements of sand traps. The two courses available for play are the United States, which consists of mostly bunkers and super rough and the Japan course, consisting of water and tight boundaries. At the end of the game, the player is greeted with a photorealistic shot of the country club lodge against the setting sun and surrounded by trees. Lee Buck Trevino (born on December 1, 1939 in Dallas, Texas) is one of the legends of the golf world. Trevino won 6 majors in his career, winning the US Open twice (1968 and 1971), The Open Championship twice (1971 and 1972) and the PGA Championship twice (1974 and 1984). He also has 29 PGA Tour wins and 29 Champions tour wins and was inducted into the World Golf Hall of Fame in 1981. He is an icon for Mexican Americans, and is often referred to as 'The Merry Mex' and 'Supermex'. He is also remembered as the player who was struck by lightning during the 1975 Western Open. Tiger Electronics purchased the license to distribute this title as a battery operated LCD handheld game. It was not terribly popular and sold poorly compared to more notable titles like Double Dragon and Batman. This page was last edited on 23 May 2012, at 23:26.